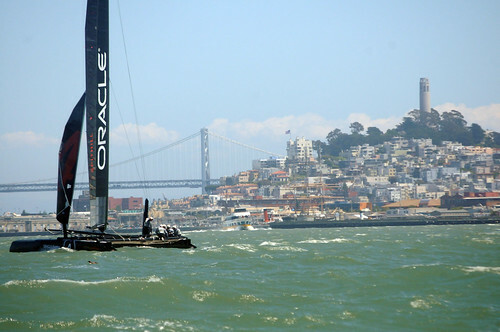 The Oracle Racing team boat skippered by James Spithill sails around the bay prior to a preparation race June 13, 2011. Courtesy of Erik Verduzco. Residents and organizations in San Francisco recently appealed the findings of the final Environmental Impact Report for the 34th America’s Cup, but were disappointed when construction was approved by the Board of Supervisors despite their protests. The EIR determined the impact event-related construction would have on air and water quality in the Bay Area, which the Board judged to be acceptable, despite contrary information from many of the city’s environmental groups. At the ground-breaking ceremony, San Francisco Mayor Ed Lee said this project would leave a legacy in San Francisco’s waterfront. “The Cruise Terminal is a great example of how San Francisco is leveraging the resources and energy of the 34th America’s Cup for jobs and long term economic benefits for the City,” Lee said. The project was originally met with opposition from organizations including the Waterfront Watch, Sierra Club, Telegraph Hill Dwellers, San Francisco Tomorrow and the Golden Gate Audubon Society. They believed disturbing the bottom of the bay would stir sediment that would affect the spectators, marine life and swimmers at the pier and Aquatic Park. At a hearing to discuss the appeal, challengers addressed their concerns about the thoroughness of the report and of possible violations of the California Environmental Quality Act. They said the report overlooked certain aspects and was not assessed properly according the the California Environmental Quality Act. Tom Lippe, who spoke on behalf of those petitioning, voiced concern about the standards used to measure the findings in the report as well as air quality. Another concern is the proposed Jumbotron, a floating screen that will stream the races so spectators can get a better view at Aquatic Park. The Jumbotron will require placement of blocks at the bottom of the bay, which they believed will stir up sediment and other toxins and metals, jeopardizing the quality of water. They were concerned that the toxins will harm marine life as well as the hundreds of swimmers who use Aquatic Park every year. Kelley Capone, environmental project manager for the Port of San Francisco, said they have done analysis of the impact of the placement of concrete blocks in the bay. “The placement of concrete blocks at the bottom of the bay floor would not cause a water quality impact,” Capone said. Capone added that the necessary assessment was done on the report and there would be no significant impact to Aquatic Park or air quality at the piers. Others from the planning department reassured the Board that the disturbance of sediment would be very minor. Supervisor David Campos, a strong supporter of the America’s Cup, said he wants to make sure the event succeeds. “We want to make sure that it’s done in a way that is environmentally responsible and that it’s also fiscally and financially responsible,” said Campos. Lippe voiced apprehension over the 80 percent reduction of spectators from the original EIR to the final version, which he says will impact financial gain for the city. He said that there are not that many people that come to these events because they were hard to see. “The economic benefit goes way down,” Lippe said.